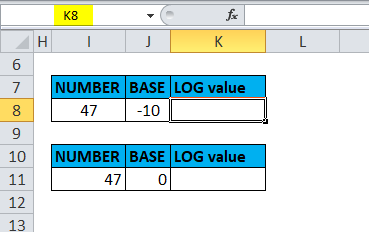 LOG in Excel (Formula, Examples) | How to Use LOG Function? 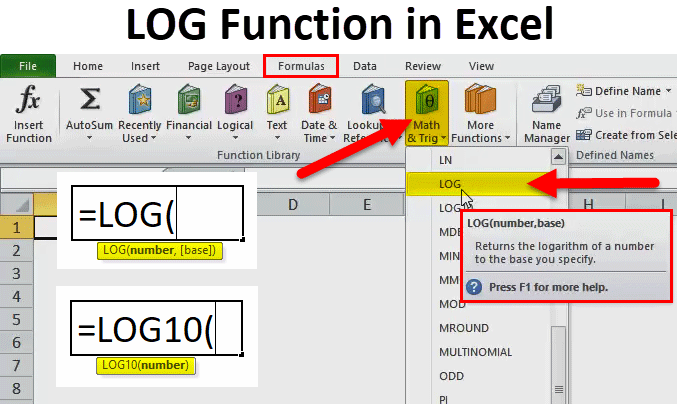 The LOG function is a worksheet function categorized under Math/Trigonometry function. 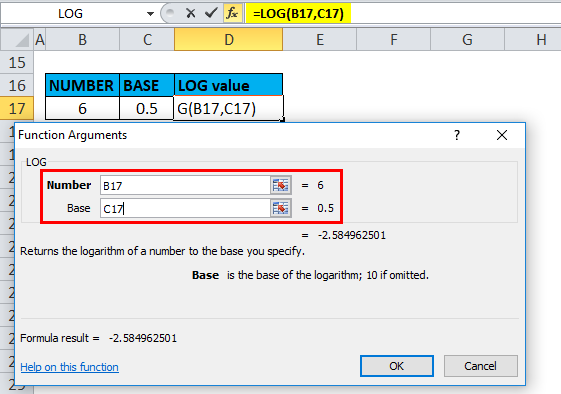 Here, the logarithm (with respect to base 2) of 16 is 4. 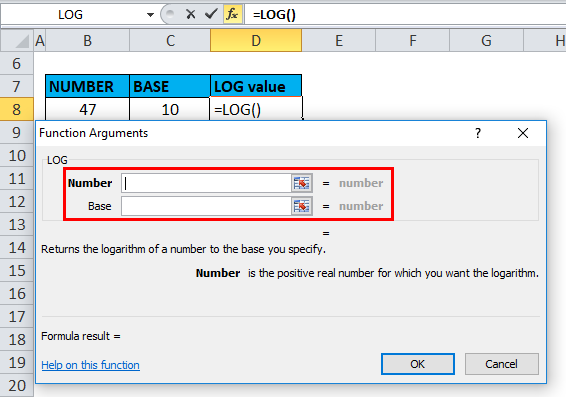 The LOG function in Excel is easy to use & very simple, it is most widely used function in statistics, finance & business analytics field or domain. The LOG function is also used to plot a graph for data representation & it is used with other tools for regression analysis. The LOG function performs the inverse operation to that of a POWER function. 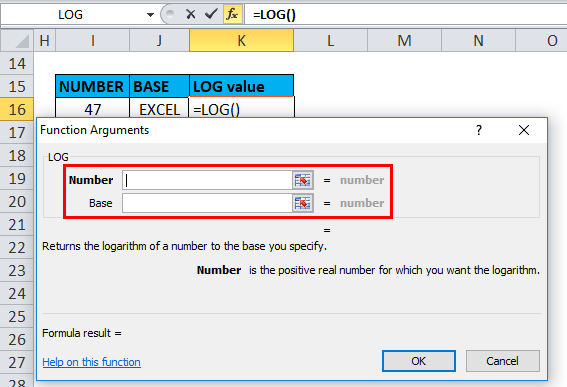 LOG function in excel calculates the logarithm of a given number, to a supplied base or it returns the natural logarithm of a number. E.G. 1000 = 10 × 10 × 10 = 103, the “logarithm to base 10” of 1000 is 3 i.e. 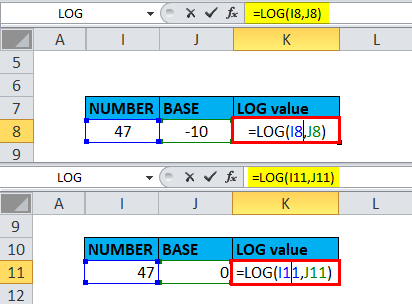 logarithm counts repeated multiplication of the same factor. The logarithm of a given number x is the exponent to a fixed number, the base b, must be raised, to produce that number x.
i.e. 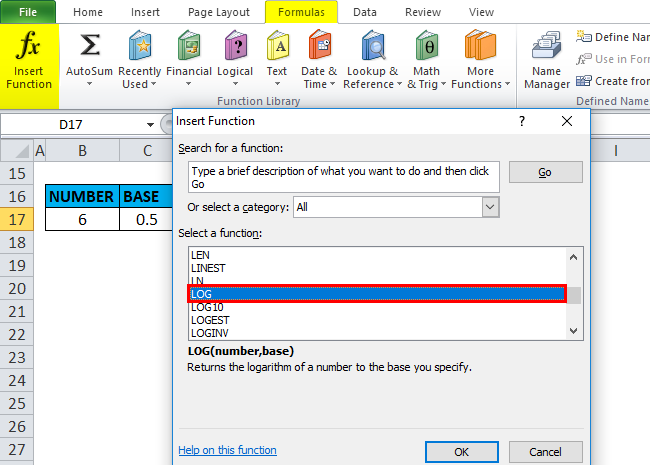 If ax = b Then Loga(b) = x.
LOG formula in Excel consists of two things Number & Base. 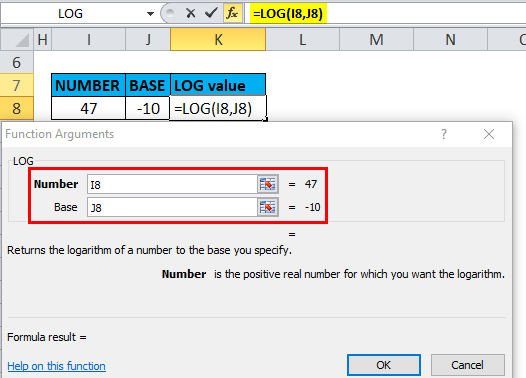 Number = It is a positive real number that you want to calculate the logarithm in excel. Note: It should be a numeric value that must be always greater than zero. 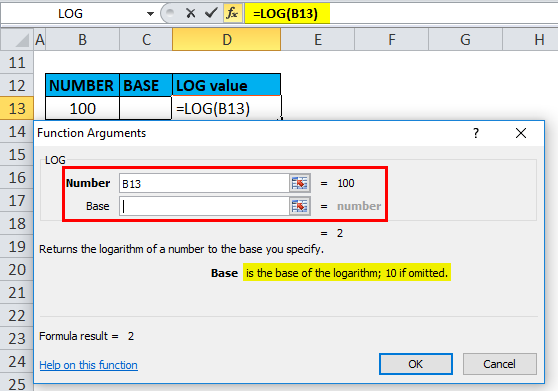 Base = It is a base to which the logarithm should be calculated or It is an optional argument that specifies or indicates the base to which the logarithm should be calculated. Note: If no base is listed, the base is assumed to be 10. 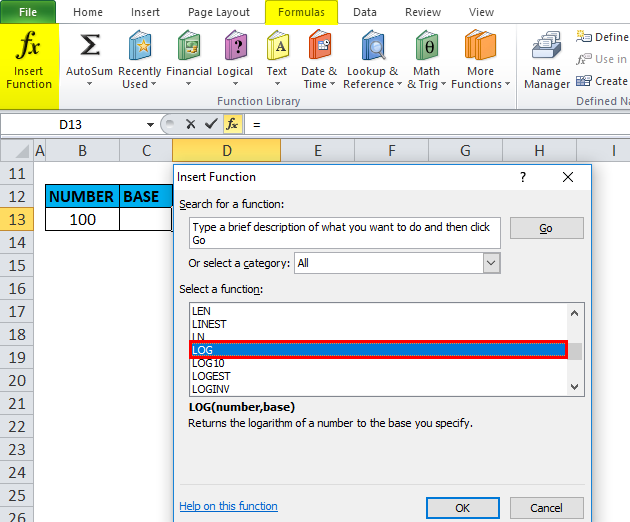 The LOG function in Excel is very simple and easy to use. 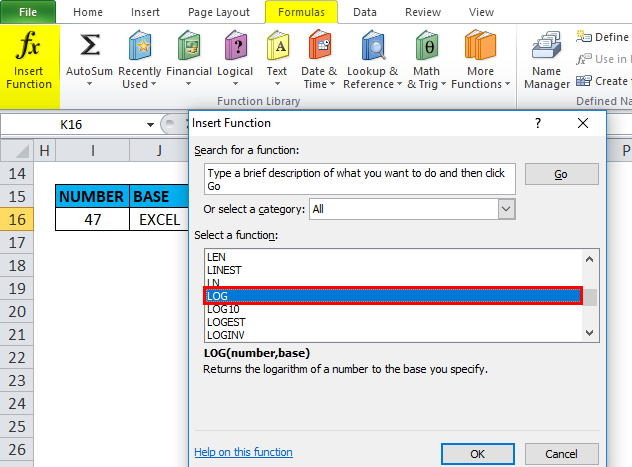 Let understand the working of LOG function in Excel by some LOG Formula example. 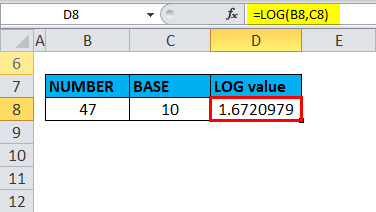 In the below-mentioned example, let’s calculate the logarithm in excel of 47, with base value 10. 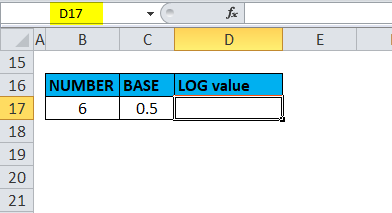 Select the output cell where we need to find out log value i.e. D8 in this example. 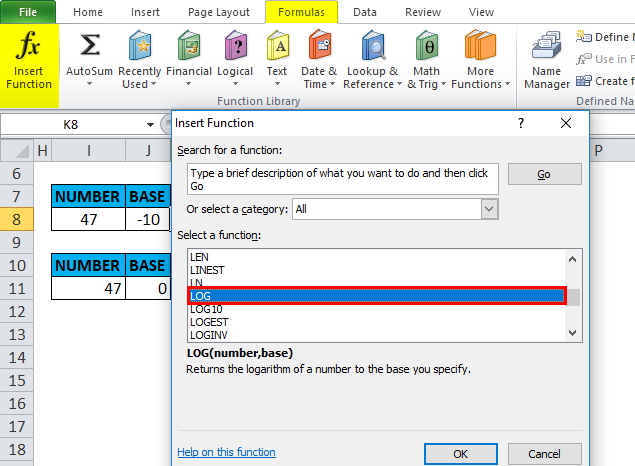 Click the function button (fx) under formula toolbar, a popup will appear, under the select function, double-click on LOG function. 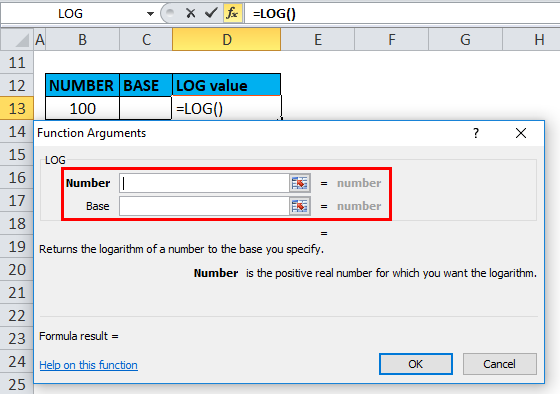 A dialog box appears where arguments (Number & Base) for log function needs to be filled. Here the number is 47 & base argument is 10. 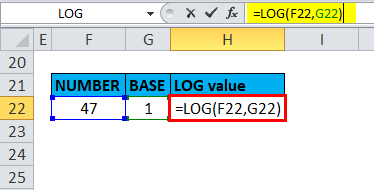 Excel calculates the logarithm value and displays the answer 1.6720979 in the output cell. 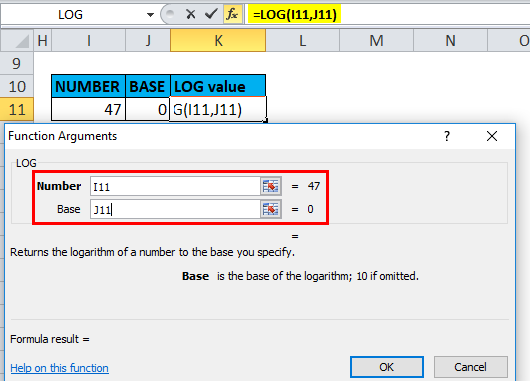 In the below-mentioned example, let’s calculate the logarithm of 100, without base value. 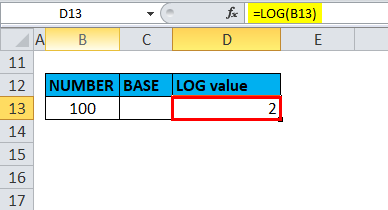 Select the output cell where we need to find out log value i.e. D13 in this example. 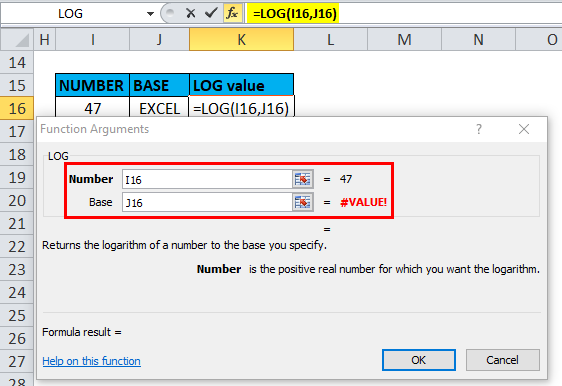 Here the number is 100 & In this log function example, Log function by default takes the base value as 10 if the second argument (Base) is not passed in log function. 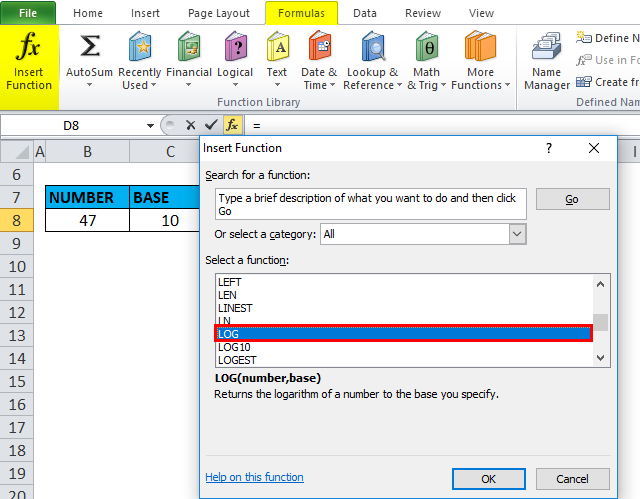 Excel calculates the logarithm value and displays the answer 2 in the output cell. i.e. 100 = 10 × 10 = 102, the “logarithm to base 10” of 100 is 2 i.e. logarithm counts repeated multiplication of the same factor. Therefore, it returns the output value or a result as 2. 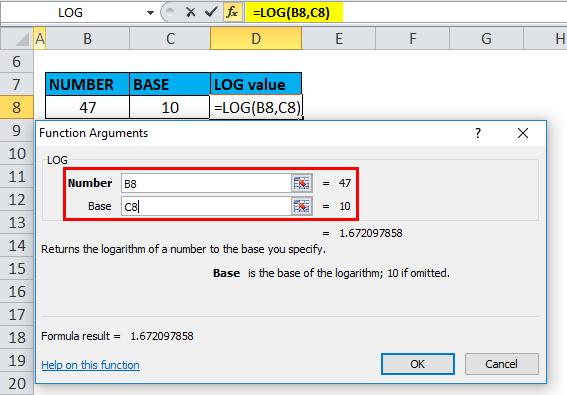 In the below-mentioned example, let’s calculate the logarithm of 6, with decimal value 0.5 as the base argument. 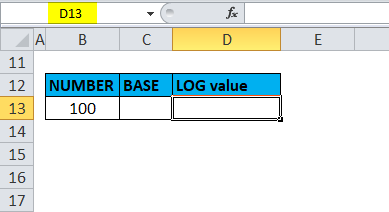 Select the output cell where we need to find out log value i.e. D17 in this example. Here the number is 6 & base argument is 0.5. 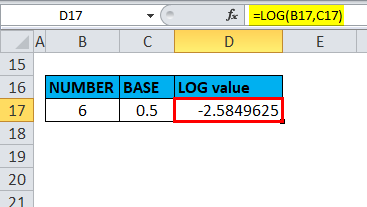 In the below-mentioned example, let’s calculate the logarithm in excel of 47, with base argument “0” ZERO or Negative value (-10). 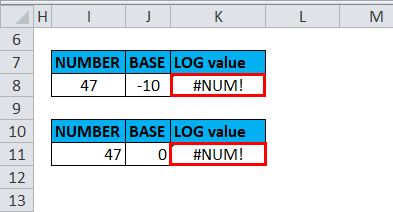 Select the output cell where we need to find out log value i.e. K8 in this example. Here the number is 47 & base argument is -1. 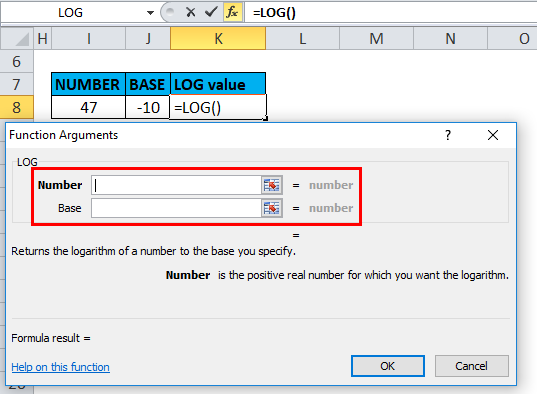 Let’s calculate the logarithm in excel value and display the answer #NUM! error in the output cell. In the below-mentioned example, let’s calculate the logarithm of 47, where the base argument is text string i.e. “EXCEL”. 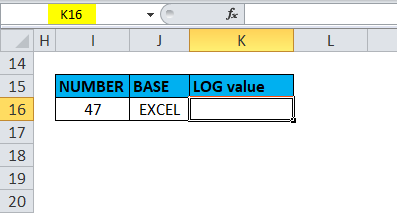 Select the output cell where we need to find out log value i.e. K16 in this example. Here the number is 47 & base argument is TEXT string i.e. EXCEL. Excel calculates the logarithm value and displays the answer #VALUE! error in the output cell. 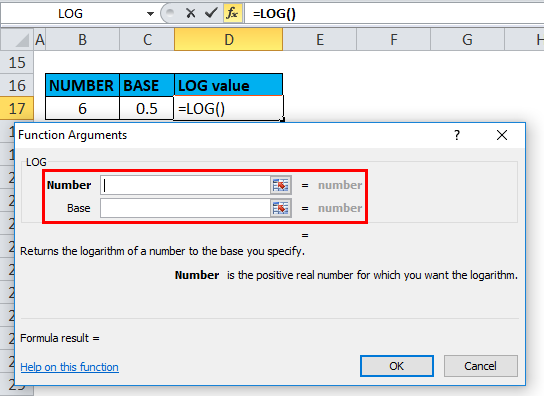 Number argument in LOG Function: It should be always a positive real number that you want to calculate the logarithm in excel. It should be numeric value & must be always greater than zero. In Base argument, if no base is listed, the base is always assumed to be 10. 1) #VALUE! – It Occurs due to or if supplied number argument or the supplied [base] argument is non-numeric. 2) #NUM! – It Occurs due to or if the supplied number argument or the supplied [base] argument is the negative value or zero. 3) #DIV/0! – It Occurs if the supplied [base] argument is equal to 1. How to Use NOT Function in Excel?